I’ve previously written about how this would be a very desirable reform of Medicaid. Today, let’s build upon some previous analysis and explain why it would be good to get Washington out of the business of Food Stamps. New data from the U.S. Department of Agriculture reveals food stamp recipients spent more money on sweetened beverages than they did on fruits, vegetables, bread, cereal, or milk. The USDA analyzed transactional data from a leading grocery store in 2011 and found that Supplemental Nutritional Assistance Program (SNAP) households spent a greater percentage of money on unhealthier foods than those who didn’t use taxpayer funds to pay for their groceries. …The recent USDA study only looked at data from one grocery store retailer. It did not examine how SNAP funds were spent at convenience stores, which presumably would have significantly increased the amount of unhealthy foods purchased with taxpayer dollars. …The second largest expenditure for SNAP households was sweetened beverages, whereas the second largest expenditure for non-SNAP households was vegetables. …SNAP households spent 7.2 percent of their money on vegetables, while non-SNAP households spent 9.1 percent of their grocery money on this category of food. When comparing fruit purchases, the gap widens slightly: SNAP households spent 4.7 percent on fruits, and non-SNAP households spent an averages of 7.2 percent in the same category. Here’s the comparison of purchases from those with food stamps and those using their own money. As one might suspect, the problem has gotten worse during the profligate Bush-Obama era. During President Obama’s tenure, the numbers and percentages of Americans using taxpayer’s money to buy their groceries has drastically increased. SNAP participation has increased 78 percent in the past ten years and remains near its all-time high… Food stamp usage also dramatically increased during President George W. Bush’s tenure… That’s because Bush signed a dramatic expansion of food welfare inside a farm bill. This expansion, among other things, made it easier to sign up and made non-citizens eligible to use U.S. taxpayers’ funds to fund grocery excursions. The program also has always had major problems with fraud, as illustrated by a recent scandal in Florida. The U.S. Attorney for the Southern District of Florida announced the largest food stamp fraud bust in U.S. history Wednesday afternoon. …500 people had their identities stolen in Palm Beach County to be used to get fake Electronic Benefit Transfer cards which were then exchanged for cash… Federal charges were filed against 22 retail store owners or operators in connection with schemes to illegally redeem food stamp benefits for cash, the Justice Department said. Indictments allege the retailers received more than $13 million in federal payments. Even millionaires bilk the system. A Geauga County millionaire—who comes from royalty—has been indicted on charges he illegally received food stamps and medicaid assistance. Ali Pascal Mahvi is facing four felony counts which could put him behind bars for more than four years if convicted. …Meyer informed Mahvi of the indictment at Mahvi’s 8,000 square foot home. …Prosecutors say Mahvi defrauded Medicaid out of $45,000 and about $8,400 in food stamps. Mahvi, who is the son of an Iranian prince, estimates his worth at about $120 million. His $800,000 home features five bedrooms and five bathrooms, an in-ground swimming pool, and stable with horses. Mahvi, who says he owns 70 percent of a resort in St. Lucia, says he’s played by the rules. And some scammers become millionaires from the other end of the system. Convenience store owner Vida Ofori Causey out of Worcester, Mass. was charged in federal court Monday after pleading guilty to $3.6 million worth of food stamp fraud. …“Causey purchased the benefits at a discounted value of approximately fifty cents for every SNAP dollar,” a press release from Department of Justice stated. “By so doing, Causey caused the USDA to electronically deposit into a bank account controlled by her the full face value of the SNAP benefits fraudulently obtained.” As a result, recipients had cash on hand to buy restricted items. The restricted items could include alcohol, cigarettes and even drugs. Stories like this reinforce the argument that states should be in charge of the program, if for no other reason than there will be fiscal pressure not to waste so much money. Moreover, there’s considerable evidence that states are more sensible in their approach. I’ve already written about good reforms in Maine and Wisconsin. Well, the Daily Caller has encouraging news that the good news in those states is part of a national trend. The number of people receiving food stamps has declined sharply due in part to the reinstatement of work requirements earlier this year, according to a report Wednesday. …“Caseloads fell sharply in April, especially in states reinstating a three-month time limit for unemployed childless adults without disabilities, new Agriculture Department data show,” CBPP detailed in its report. “The data, covering the first month in which most of the roughly 20 states that imposed the time limit in January began cutting people off.” The USDA has required food stamp work requirements since an overhaul of the program in 1996. Able-bodied adults without children are required to work at least 20 hours a week or else lose their benefits after three months. …Work requirements have now been restored in a total of 40 states compared to 44 states this past June that had either a waiver or a partial waiver. And let’s look specifically at some positive developments in Kansas. …before Kansas instituted a work requirement, 93 percent of food stamp recipients were in poverty, with 84 percent in severe poverty. 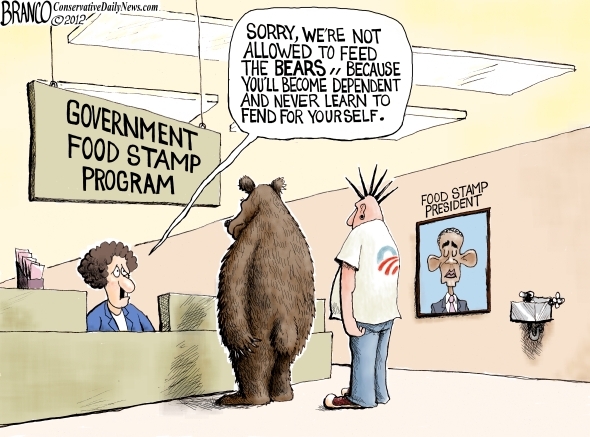 Few of the food stamp recipients claimed any income. Only 21 percent were working at all, and two-fifths of those working were working fewer than 20 hours per week. Once work requirements were established, thousands of food stamp recipients moved into the workforce, promoting income gains and a decrease in poverty. Forty percent of the individuals who left the food stamp ranks found employment within three months, and about 60 percent found employment within a year. They saw an average income increase of 127 percent. Half of those who left the rolls and are working have earnings above the poverty level. Even many of those who stayed on food stamps saw their income increase significantly. …Furthermore, with the implementation of the work requirement in Kansas, the caseload dropped by 75 percent. Previously, Kansas was spending $5.5 million per month on food stamp benefits for able-bodied adults; it now spends $1.2 million. P.P.S. Just in case you think fraud and waste is a rare problem in the program, here are some other examples. P.P.P.S. While I periodically mock California, folks in the Golden State deserve praise for being the least likely to use Food Stamps. Their neighbors in Oregon, by contrast, are very proficient at mooching.